Imagine one of the last undeveloped and untrammeled stretches of Indochina. Crossing a remote and newly-opened border, climbing over the ranges of the "Laotian Alps," through small hilltribe villages and towns, and forested-national parks to the bucolic river valleys north of Luang Prabang. As we pioneered bicycle tours in Vietnam during the early 90s, we've been organizing a few unique bicycle trips in and into Laos. As we always tell travelers, we love travel and biking in Europe but so much revolves around vanished cultures. In Southeast Asia, you will witness vanishing cultures as the region is enveloped by globalization. With VeloAsia, you'll go beyond the ordinary trip and experience local cultural in unforgettable encounters, all carefully-planned and led by the most experienced and knowledgeable guides in the region. Our Laos bike tours will please both the adventurous traveler and those seeking a more comfortable, luxurious experience with our ultimate Luang Prabang stopover. We've designed this to be a wonderful few days, balanced between sightseeing on foot, bicycle and relaxing at the wonderful La Residence Phu Vao. A private baci welcoming ceremony, time with an endangered Asian elephant at a local camp learning care about the project, a private audience with monks within their temple, and a cooking class round out the unique experience of this special trip highlighting the best of Luang Prabang. Note: Hotels and regional airlines can fill for December by early August, advance planning for this time of the year is highly recommended. The overland biking tour from Hanoi all the way to sublime Luang Prabang, or even down to the capital, Vientiane if you've the time and energy, is a glimpse of what many neighboring countries looked like years and even decades ago. Cuisine is always a focus and we'll eat away along the way and also enjoy some off-bike sightseeing, boating on Mekong River and spending a day trekking in remote Muang Ngoi. As we said about Vietnam, go now before it quickly changes. On the border of China, investment and projects are rolling into the country - thankfully, primarily in the capital city now. 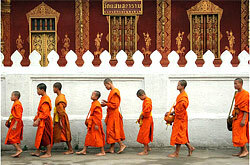 Although we recommend finishing in Luang Prabang (or Vientiane), the itinerary can be reversed. Activity Level: / Intermediate to advanced biking, from 3 to 7 hours per day, mountainous terrain. Full support. 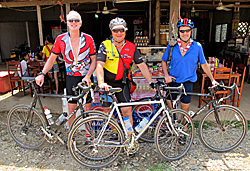 Weather for this bicycle tour in Laos is cool in December to hot in early July. Monsoon season in July to early September. "The crews on both sides of the border did a great job of preparing and executing our trip. We were pleased with the balance of riding and sightseeing, all under the eager care of our guides and drivers." Toby Mumford, Tiburon, CA. Savor Luang Prabang's rich old-world culture, tranquil landscapes, majestic architecture, fabulous cuisine, and luxurious resorts with a blend of outdoor activities, including biking and trekking in the bucolic Nam Ou River Valley. Options for day rides from Luang Prabang include shorter (30 kilometers/18 miles) or a longer cycling loop (58 kilometers/35 miles), passing through and visiting, informally, a local village, farm, temple, and school during our ride to enjoy a glimpse into Lao lifestyles. Optional activities include a splendid elephant camp with young, endangered Asian elephants learning about their care (we arrange private encounters, just you and your new very large friend). A cooking class is highly-recommended and we can give you information on the separate offerings in town or at your resort. What would a visit to Luang Prabang be without meeting a monk? Most tourists impersonally photograph the monk as they make their rounds in the morning. We'll take you into a local temple to actually meet with monks and learn about their lifestyles (while they ask you about yours). This itinerary also makes the perfect honeymoon escape or an unforgettable family trip for children of all ages. Contact us to request a detailed itinerary for you dates of travel. Activity Level: All abilities, flat, leisurely biking to an intermediate itinerary with longer rides, by preference. Optional Extensions: Angkor (two hours by air), Hanoi and Halong Bay (one hour by air). Weather in Luang Prabang is pleasant to hot, with the monsoon season in July to early September. Arrival Cities: Bangkok, Chiang Mai, Siem Reap, or Hanoi. See our Luang Prabang dining and cooking classes page (login required). "What an unexpected wonderful place Luang Prabang turned out to be. Of course we enjoyed the fabulous La Residence but the interesting activities that you'd planned for us and your guide made the trip one of our best we'd ever had. Chit was an angel, who genuinely cared for us in every way. After our time with him we were heartbroken to say goodbye." 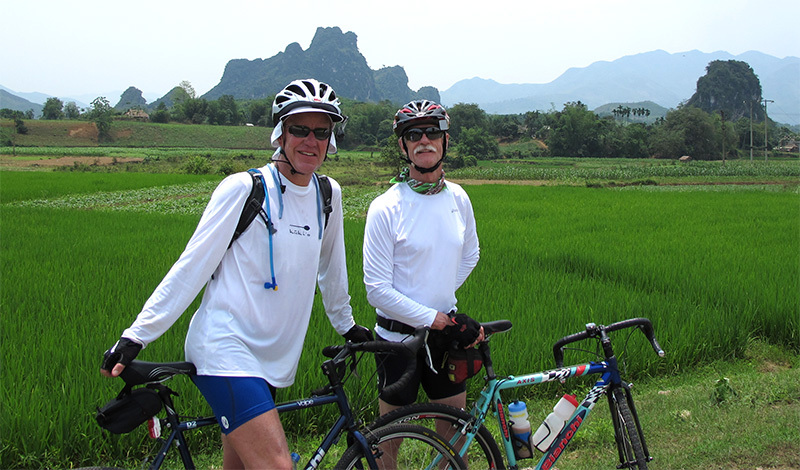 L. Feinberg, NYC"
Ten years in the planning, the ultimate Laos bicycle tour! Our original bicycle tour of Laos, this longer itinerary adds three days of cycling over another pass out of Luang Prabang, then descending to the karst river landscapes of Van Vieng. Another day of mountain biking through the canyons of scenic Van Vieng and exploring the extensive caves by foot, as well as river and lagoons, before we decamp for the capital city, witnessing the rush of modernization while canvasing the old sites that remain. Almost all of our trips are private ones for families, small groups of friends and organizations. Please contact us to design a trip for you in Laos. 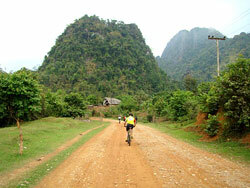 In 1992 VeloAsia pioneered the first cycling, kayak, and trekking adventures in Vietnam. Since then, we've organized original and unique trips throughout the region that are, as many of our past travlers have said, the adventures of a lifetime. Let us plan and organize your private adventure in Vietnam, Laos, Cambodia, Thailand, Myanmar and Bhutan. Our 26th Year | 2019 VeloAsia . All rights reserved.